Creating highly detailed and accurate cosplay costumes, Yaya is a well-known face in the world of cosplay, or creating and wearing costumes based on anime, science fiction, and fantasy characters. She has been a guest of honor at anime, science fiction, and gaming conventions around the world. LoveToKnow Costumes had the opportunity to speak with Yaya about her work and the world of cosplaying. 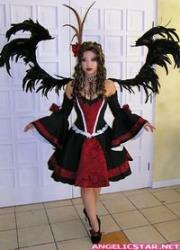 LoveToKnow: Why do you think so many fans of anime, video games, science fiction, and fantasy are involved in cosplay? What first drew you to cosplay? Yaya: Many of us cosplayers enjoy making and wearing costumes to feel more connected to a certain character we love, to be social, or to be artistically stimulated. I got involved in cosplay because I thought it would be a fun and creative way to show my love for certain shows and movies. It also was an instantly social hobby that let me meet a lot of people who are into the same fandoms. LTK: What are the best things about being involved in cosplay and making cosplay costumes? Yaya: For me the best part about cosplay is definitely making the costumes. I have always been an artistic person, and until I discovered cosplay, drawing and painting were how I expressed myself creatively. Turning designs I put on paper into three-dimensional costumes was simply taking it one step farther, and I love it. I love the process of making a costume, from the thrill of finding the perfect material, to the problem solving involved in realizing the challenging construction of a garment, to the excitement of putting on the finished costume and showing it at an event or doing a photo shoot. I have also learned a lot of new skills besides sewing over the years: styling and cutting wigs, sculpting and casting props and accessories, web design and editing photos, making life-size feather wings, etc. With each costume project I try to learn something new, but the intricacy level of my costumes always depends on how much time and money I have at the moment. LTK: Is there any down side to cosplay? Yaya: Certainly, like any other community, you get the good and the bad. My main frustration is never having enough time and money to realize all the costumes I'd like to make, or not being able to find the perfect materials. This is a very expensive hobby! You also run into negative social situations, especially when you've been around doing this as long as I have. Everyone has an opinion of you, many of which are prejudiced. Trying to connect and appeal to everyone is impossible, so I just put out what images and words I believe in and let people think what they want of it. LTK: How do you decide which costume to design next? Do you simply choose an outfit that catches your eye, do you think about the personality of the character, or is there anything else you consider? Yaya: Most of the time, if I am going through the effort of making a costume, I love the design and the character, or there is some aspect in the design that I want to make. Every once in a while I make a costume to be a part of a group, and then it's more about who fits what part. I generally keep a couple of categories in mind while looking for the next project - easy/for fun and elaborate/challenging. Lately due to my limited free time, most of my costumes have been more easy/for fun. LTK: Do you have any favorite costumes, or is it too hard to choose? Baelfir the Fire Fairy because I put so much time and love into the costume, even when I had no idea what I was doing. I would like to re-make this costume with the knowledge I have now. Lady Deathstrike because it is so fun to take fighting photos with everyone at conventions! Lulu because I worked so long on this costume. Felicia because I like my wig and paws, and it's such an upbeat character; you're always in a good mood when you wear the costume! LTK: Do you have any favorite materials for constructing your costumes? Yaya: Feathers. I adore feathers and want to make wings for each costume I own. I also love rich, thick brocades, and I use glass beads a lot. LTK: What advice do you have for anyone looking to get involved with cosplay? Experiment and try to solve a problem yourself first before turning to others for help. It's much more fun and satisfying that way. Make a mock-up of a costume out of cheap muslin, fit it to yourself, then cut that costume apart and use it as a pattern for your real outfit. It saves you from possibly ruining your expensive fabric, and ensures that the costume fits perfectly. Always use a wig if you can help it, and make sure your footwear matches the costume. Girls - gel or foam insoles for heels are your best friends at a convention. Lastly, do this for your own fun! LTK: How did you make the move from costuming as a hobby to costuming as a career? Yaya: It just kind of happened gradually, and it wasn't until recently that I considered it a career. I never seek anything out on my own. People just come up to me and ask me to be a judge, or do a promotion, or a fashion show, or I get emails from conventions asking me to be a guest. Everything I've done in my credits has been due to others seeking me out. I just keep my website updated and list my skills and abilities. I do enjoy traveling to shows a lot and meeting people, as well as sharing my knowledge and helping out with an event. I still have great aspirations for a career in the field of costuming, so we'll see what happens! For more information on Yaya's cosplay costumes, including pictures and construction details, visit her online portfolio at YayaHan.com.